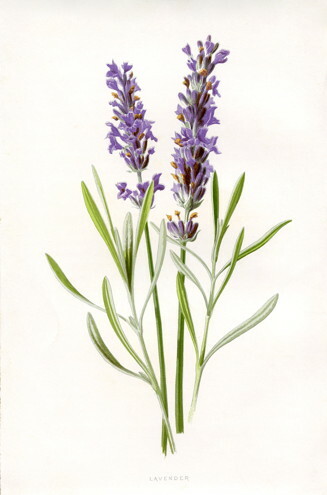 Lavender (genus Lavandula) is named from the Latin “lavare,” which means “to wash.” Ancient Romans used lavender in their famous baths as a perfume. People knew you were clean because you smelled of it afterward! The confusion begins to arise because the Greeks called lavender “nardus,” referring to the city Naarda, where lavender was often sold. Many simply called the plant “nard.” However, the Romans called lavender “asarum,” because they believed the poisonous asp viper lived among lavender bushes. Now that we’ve gotten that out of the way, let’s all inhale a little lavender oil and relax! This noble herb has been used for over 2,500 years, starting with the ancient Egyptians who used it as a part of the mummification process and also as a perfume. It’s use was also widespread among the Arabs, Romans and Greeks. Modern Wiccans believe its magical properties include sleep, long life, peace, wishes, protection, love, purification, visions and clarity of thought. Christians of earlier times regarded lavender as a safeguard against evil, and hung a cross of lavender over their door for protection. The most beautiful and holy use of lavender I’ve encountered is at one of our local hospice centers who bathes its dying patients with lavender-scented water. It relaxes the patient as well as their family! What a lovely gift to both! This entry was posted in Creation Spirituality, Herbology and tagged Pagan, Spirituality, Wicca. Bookmark the permalink. Thank you so much for this article; finally a clear explanation! I am researching plants used in our church’s biblical garden, located in Arizona. I know lavender was widely used by Egyptians prior to Jesus time but it is not specifically mentioned in the Bible. I believe Spikenard is a different plant from lavender but I also think there are many interpretations about what the various writer’s meant when they mentioned spikenard and nard so there is much room for discussion. We often make a note when we have a controversy about a certain plant to explain our use vs the “real thing” and your explanation is terrific!